Porcelain veneers in Fairfax are a wonderful way to invest in yourself. This treatment can completely cover up the appearance of the teeth that show when you smile -- dramatically remaking your overall “look.” Fairfax Dental Group is pleased to offer stunning veneers alongside our full list of cosmetic dentistry services. 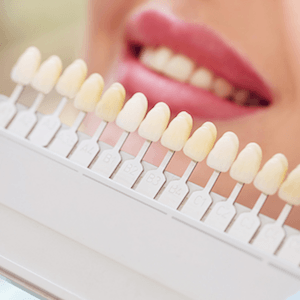 Below, find everything you need to know about porcelain veneers, including how they work, who they are for, and how to get started. Porcelain/dental veneers (or just “veneers”) are thin restorations that can be placed on the front side of the upper teeth in the front of your mouth. These teeth are the ones we also call the “social six,” since they affect the appearance of your smile the most. Porcelain veneers are permanent restorations and cannot be removed except by your dentist. They are considered an irreversible treatment -- meaning once you have had them, you will always need something covering up your teeth. Porcelain veneers are a good option for teeth that are healthy overall but which suffer from aesthetic issues. Veneers are placed over the course of two visits to our office. During the first appointment, your cosmetic dentist will put together your treatment plan and prepare the teeth to receive the new restorations. A small portion of enamel must be removed from the front side of each tooth. Once this has occurred, an impression or mold is made. Temporary veneers cover up the teeth for a period of one to two weeks while the permanent veneers are created in a separate lab. Once the veneers are ready, you return to our office for the final appointment. This is when we take off the temporaries, check to make sure everything fits just right with the permanent ones, and place them securely onto the front of the teeth. Considering the multitude of benefits they provide, it’s a pretty short process to get veneers. Once it is complete, we know you will love your new smile! With proper care, veneers can last for up to 20 years. They will eventually need to be replaced due to natural wear and tear and changes in the structure of your mouth. To ensure that the veneers stay sturdy and functioning properly, keep the following tips in mind. Brush and floss regularly and gently, using a soft-bristled brush and fluoride toothpaste. Avoid aggressive tooth brushing, which can lead to gum recession that exposes the tooth enamel and/or tooth’s root. Avoid biting directly into hard or crunchy foods. Visit your dentist regularly for a checkup and cleaning. Porcelain does not stain, so your veneers will stay the same shade of white for years to come -- and a routine polish will ensure they sparkle as well. If you are interested in improving the appearance of the teeth that show when you smile, we encourage you to get in touch with your cosmetic dentist in Fairfax right away. We can’t wait to help you love your grin! Contact us today.